The objective of this program is to offer the members a shared experience and a chance to get to know each other better through challenging activities in a camp setting. The emphasis will be on fun, excitement, personal challenge and team support. Located on the primeval forest, at the foot of LangbiangMountain; Cu Lan Village is a small beautiful and peaceful village of the Lat people. With beautiful natural landscapes and romantic Silver stream flowing through, Cù Lần Village will certainly give you unforgetable wonderful experiences. 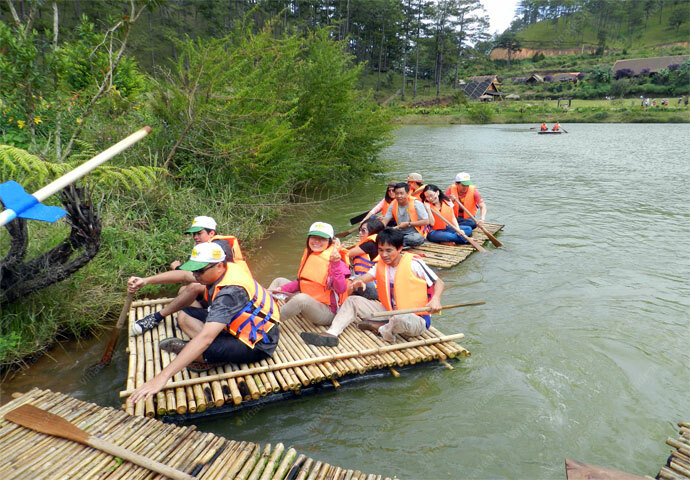 Let's join us, Teambuilding program at Cù Lần Village, Dalat Tours will help you enjoy the beautiful landscape, discover new things; and finally, break out the peaceful of this Village by our profesional team games. Type: Finding treasure.- Action, competition, Passing challenges and cryptograms to find the treasure. Bus will pick up you from Hotel. Arrive to Cù Lần Village, then sight seeing for 20 minutes before Action. Meeting at the Wild Flower Paradise’s Square. The Group will be divided into teams of 4-5 members . Then teams will select the captain who can lead them to be the winner. Warm up with the excited Flash mob (15 minutes). Teams will have the scarves and flags. After that, they will design their own logo and slogan – the spirit of team. Teams will conquer the challenges, meanwhile unlock the cryptogram to know the next challenge. Challenge 1: Team’s Spirit- I trust you, my captain.. Challenge 7: Modern Vietnamese Cinderrela - Cô Tấm ngày nay. Winner is the one who find the Lat’s treasure. Try your best. What do you receive when joining this Program? A/C vehicle transfers as in the program. Fees for Flash mob, Demonstration. - Special gift for winner. Any service not clearly mentioned in the above “Includes” paragraph. The above quoted price is subject to change due to changes in the program and number of participants. Final payment must be received 3 weeks before the date of the event. Payments can be made in Vietnam Dong or US dollars. Payments received in US dollars must be based on the current exchange rate on the date of payment. 7 days or less before the event: TA Travel will retain 50% of the Total Cost. 3 days of the event: no refund. 1 extra suit to change after Aqua Challenges. WISH YOU A NICE TRIP!